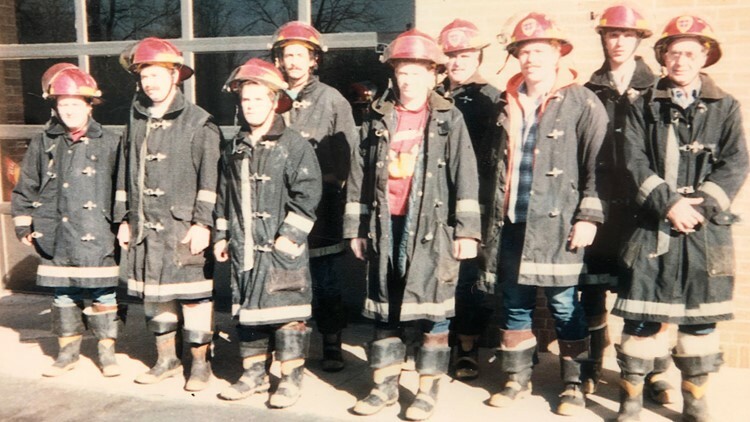 25 years after firefighter Craig Drury died from injuries sustained on the job, his coworkers and family members continue to search for answers. For the Drurys, fighting fire was a family affair. 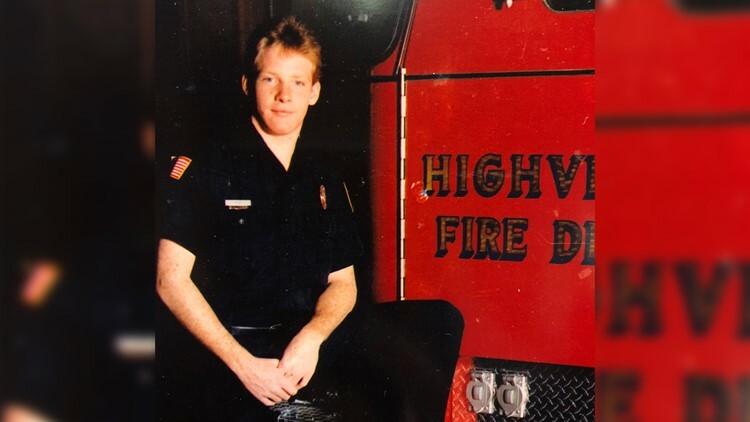 Craig Drury's father was a longtime chief at Highview Fire, and when it came time for Drury to follow in his dad's footsteps, he jumped at the chance. “As soon as Craig could become a junior firefighter, he did,” Stacey Stetson, Drury’s sister said. "He was a sergeant at 24. He really loved it too." It's was in his dad's fire car, Stetson said, that the Drurys received the call that would change their lives forever. Craig Drury poses for photo in front of the Highview Fire District truck. On August 24, 1994, the Drurys responded to a house fire in southeast Louisville. Craig Drury was inside the house, working to drown the flames with a few other members of the crew, when the home became engulfed with flames. “As soon as we pulled up, [the home] exploded into flames,” current Highview Chief Dave Goldsmith recounted. Drury was trapped. His fellow firefighters worked to get as many of their brothers out as they could, but Drury was one of the last to be rescued. “He was a redheaded, freckle face kid...when I got over to him that night he was just a pink-faced kid. There was no freckles," Goldsmith said. Drury had sustained serious life-threatening injuries that required him to be airlifted to University Hospital. Though many of his fellow firefighters did not see Drury that night, they knew the gravity of his situation once the medics arrived. “When the helicopter landed, I knew it was bad,” Rob Dwyer, now the deputy fire chief, remembered. Dwyer, like other firefighters who responded that night, was one of the men that rescued his brothers trapped in the house. Though he found two of the firefighters, Dwyer did not find Drury — something he still looks back on today. And Dwyer is not the only person who blamed himself for Drury's condition. Goldsmith seconded Dwyer, saying the group all felt the blame. Highview is like a brotherhood, and when your brother is hurting, you hurt. 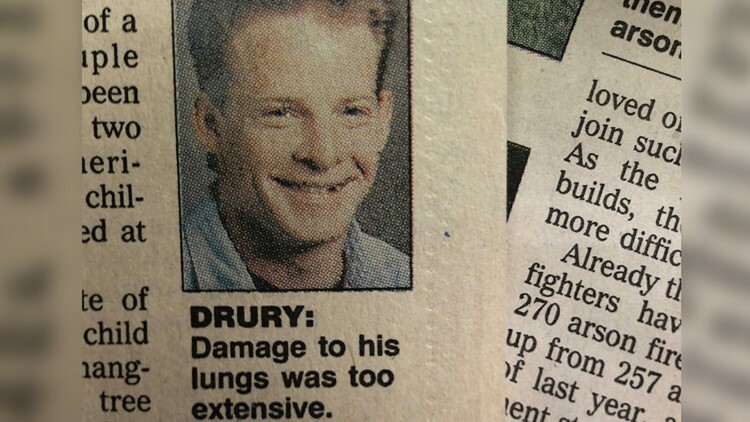 The night was especially tough for Drury's father. His son was taken to the hospital as his crew continued to fight the flames that put his life at risk. “I never really got exactly what happened from my father, he couldn’t talk about it," Stetson said. "It just tore him up." 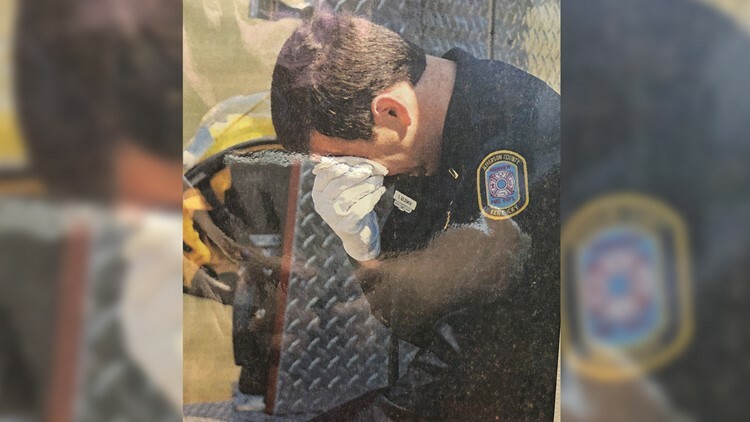 Clipping of a newspaper showing a picture of one of Craig's fellow firefighters crying at his funeral. Drury's lungs were extremely damaged from the fire, and he was placed in the intensive care unit, working to stay alive for 12 days. “At first we thought, 'This is going well, he is going to recover,” Stetson said. But the damage to his lungs was too much to bear. On September 5, Drury died from the injuries sustained from the fire. Drury, engaged to his fiancée Penny, was buried on Friday, September 9. Their wedding was scheduled for the next day. 25 years later, Goldsmith said he still remembers when everything hit him. He remembers the elementary students standing with a flag. He remembers how beautiful the ceremony was. He remembers the pain. "We respond to other people’s tragedies, but when it happens so close to home it hurts," Goldsmith said. A newspaper clipping of Drury's obituary. Adding to the family and friends' pain was the cause of his death. Drury died fighting a fire for which no one was held responsible. Police arrived on the scene as soon as they heard it on the radio, collecting as many clues as they could to how this fire happened. All signs led to an intentionally-set fire. "We learned a number of things from investigating the fire scene and within a number of hours everyone involved in examining the scene felt like it was a case of arson," Larry Fore, the lead investigator assigned to the fire, said. Knowing the fire that killed Drury was no accident made family and friends angry and desperate for answers. “That was a dark, dark period," Stetson said. Detectives searched for leads, extending their reach into neighboring counties, but Fore said there was never enough evidence to charge anyone for the crime. Several people suggested the fire was a hate crime, with firefighters even noticing a doll figure hanging from a tree in front of the house. Still, detectives could not find enough evidence to support the claims. “It's probably one of the more frustrating crimes to investigate because first you have to prove that it was arson," Fore said. "And then secondly, you have to do what happens in all other crime investigations — you have to find the people responsible and prove they did it." The case was presented to grand jury, and police attempted to indict multiple people for the fire, but the grand jury said no. Another dead end. Craig Drury with his brothers at the Highview Fire District. Still, Fore said he believes the case can still be solved. “I think it's still possible that someone can be found, identified and charged in this case," Fore said. "I do believe that there are people out there with knowledge of what happened." And while it's been 25 years since Drury's death, friends and family are still desperate for answers. Drury's father and mother passed away before getting any answers. His brothers at Highview are hoping they finally see someone brought to justice before they retire. "Whether it was intentional, whether it was an accident, vengeance or whatever, it was still wrong," Goldsmith said. "Somebody lost their life because of that. Somebody who volunteered their time to help protect other people lost their life because of somebody’s act." Stetson said that to this very day she wonders who did it, who took her brother away from his family. And like Fore, she knows someone has answers. Until someone is brought to justice, Drury's family and friends are left searching for answers in that horrible night 25 years ago. "Somebody decided to burn a house down and so many lives were changed that night," Dwyer said. "It hurts 25 years later. I’m not a 24-year-old kid anymore." Even the smallest clue could help investigators connect the dots and find the person who set the fire that killed Craig Drury. If you have any information, please call Louisville Metro Arson Bureau at 502-574-3721, or email them at lmgarson@louisvilleky.gov. Get a Behind-the-Scenes look at Craig Drury's story here.